On May 6, 2015, the first ever fully automated commercial shipping trucks were launched in Nevada. Run by a fairly simple system of cameras and radar, the trucks have been heralded as the future of getting things from here to there. The trucks, designed and maintained by Daimler AG, currently run autonomously and will alert a passive “driver” if and when the system gets confused or needs assistance. If the driver is unresponsive, the rig will pull over to the side of the highway and wait for a human operator to correct the problem or take over. The goal, of course, is to remove the passive driver altogether once the technology has been tested and proven safe. Automated vehicles are often the poster child for what is possible with technological advancements, and for good reason. Vehicle automation is a prime example of technology doing precisely what it is intended to do; make our lives easier by shifting the burden of work away from humans and onto machines or computers. Automated trucking can allow companies to transport goods cheaper, quicker, and with a chance of causing an accident close to zero. In the early stages of testing, autonomous vehicles have found to be far less accident prone than their human counterparts. What’s not to like? There are currently 3.5 million professional truck drivers, and thousands of small highway-adjacent towns that survive on the revenue they receive from truckers passing through. 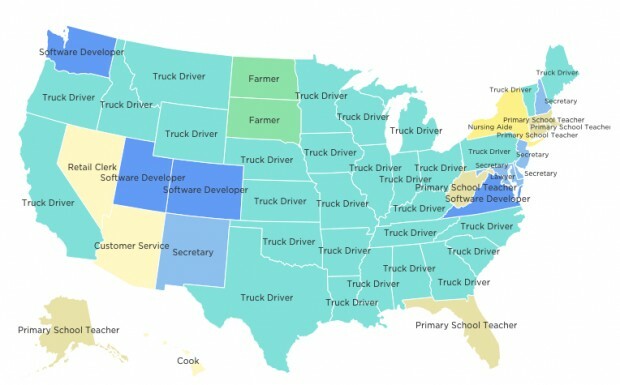 A 2014 survey of job prevalence in the United States found “truck, delivery and tractor driver” to be the most common job in 28 of the 50 states, up from only 9 states in 1978. Trucking has been immune to massive changes in the rapidly globalizing economy over the last 40 years, as a truck driver can’t be outsourced to China or replaced by a computer. However, with the rise of automated vehicles, that is all about to change. According to Morgan Stanley projections, vehicle automation will be used in limited applications until 2022, and reaching full market penetration by 2026, meaning a massive industry shift in as little as a decade. Trucking automation, and its industrial and economic potential, is cause for concern. Millions are poised to lose their decent-paying jobs in trucking, without a clear vocation or industry for those who are displaced to enter. With nationwide unemployment and underemployment at higher-than-hoped levels for nearly a decade, any mass layoffs in such a strong industry are troubling, to say the least. Additionally, trucking is not alone in its potential autonomous future. Robotics and software substitution (sometimes called software “bots”) are becoming ever more capable of replacing a wide spectrum of human activities once considered technologically out of reach. Of course, the fear of technology replacing human labor is nothing new, and this fear actually predated almost all of the technology we use on a daily basis today. “Luddism” is a 19th century movement of English artisans and textile workers who feared the rapid pace of technological advancement and what it could mean for the demand and value of their skill. “Luddites,” named after quasi-fictional folk hero Ned Ludd, saw power looms, stocking frames and spinning frames replace their employers’ need for their labor. In response, workers vandalized and sabotaged the machines, temporarily halting the demise of their craft. The destructive protests became so widespread that the British government began guarding industrial machinery and made machine-breaking a capital offense. It is important to note that Luddites did not hate technology as a concept. Most Luddites understood that technology had the capacity to make their lives immeasurably better. What Luddites did oppose was management using technology to sidestep labor laws, reduce wages or decrease the number of people employed. One does not have to be a radical like Kaczynski or oppose technology in its entirety to recognize the significant socioeconomic and political problems associated with the advent of new labor-replacing technologies. Former Microsoft CEO Bill Gates has recently warned the political and businesses classes that they are unaware of the implications of, and not prepared for, the modern tech-based economy in which there is an ever declining need for human labor. At a meeting held by the conservative think tank the American Enterprise Institute in 2014, Gates said, “Software substitution, whether it’s for drivers or waiters or nurses, it’s progressing. Technology over time will reduce demand for jobs, particularly at the lower end of skill set.” Gates went on to say, “Twenty years from now, labor demand for lots of skill sets will be substantially lower. I don’t think people have that in their mental model.” According to Gates, even jobs once considered “safe” like teaching and engineering will become more and more vulnerable to software substitution. In 1930, economist John Maynard Keynes predicted that within 100 years, advances in technology, and the resulting increases in efficiency and productivity would allow people to earn more and work less. He optimistically claimed that people would only need to work approximately 15 hours per week, and still attain a comfortable middle class lifestyle. Eighty-five years after his prediction, we can confidently say that the prediction will not come to pass. We have witnessed an explosion of technology, efficiency and productivity, but haven’t seen the benefits of that technology and automation trickle down to workers. So, what happened? Instead of the benefits of automation and increased productivity being spread widely among society at large, the benefits of automation have been concentrated at the top of the national economy. Businesses have been able to replace humans, who require significant long-term monetary compensation and benefits, with technology that requires a large upfront cost, but is cheap to maintain over the long-term. Looking at it another way, management has successfully replaced a great deal of human labor with technology, thus saving the company a great deal of money, while also contributing to unemployment and ultimately economic inequality. This practice will only become more and more common as technology gets better and more advanced. This troubling trend began around 1975; until that year, productivity and wages kept pace with one another. 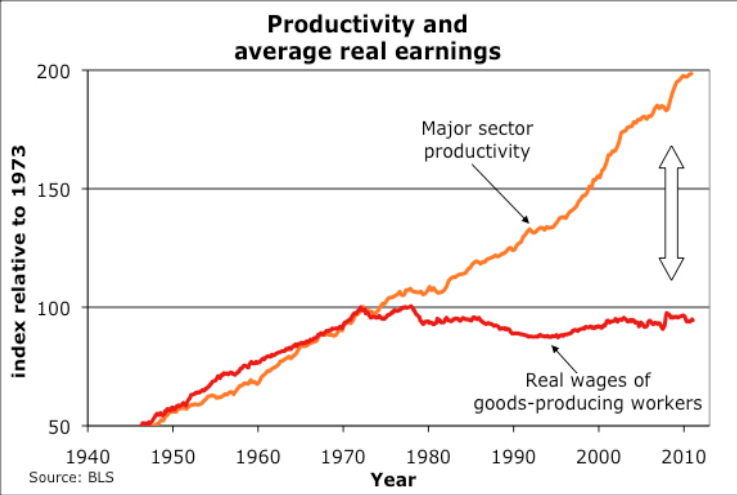 However, wages and productivity decoupled around 1975, and wages for workers remained stagnant essentially indefinitely thereafter. The benefits from the ever increasing productivity brought by technology went almost exclusively to the top. Proponents of increasing the minimum wage argue that if wages had kept up with productivity since 1960, minimum wage would be set at over $20 per hour today. So then, what is to be done? Policy makers have a few options. One option, which is an increasingly popular one with those in Washington, is to simply do nothing. This option would allow workers to fall by the wayside as technological change radically reshapes the economy. Workers would be on their own to find an alternative way of paying the bills, or languish in poverty. While this option may be popular with libertarians, free-market advocates or rugged individualists, it is problematic for obvious reasons. It is more likely to lead to economic distress, social upheaval, and political revolution. Another option would be to revisit the depression-era labor laws that determined the length of the standard work week. A “full time” work week could be considered 25 hours per week, rather than 40 hours per week. This too could be problematic if employers dramatically reduced wages to coincide with the reduction in work required by each individual worker. Stronger wage guarantees and labor protections would almost certainly be required if we traveled down this path. One option that is growing in popularity is known as the “universal basic income.” The UBI would be a program in which every citizen is given a guaranteed minimum income regardless of whether or not they can, are able to, or need to work. This proposal has been drafted in the face of the idea that technology has or will advance to the point where not everyone in society is required to work; a notion that may very well be true, but is contrary to America’s puritanical economic culture and work ethic. This path is so radical given American political culture, that a severe economic meltdown a magnitude or two greater than that of 2008 would almost certainly be required before it is even considered a serious option. Though, if the worst projections about the declining value of human labor are to be believed, that may not be an impossibility. In addition to these options, there are a plethora of ways people can mobilize on the grassroots level to push for political and economic change. Regardless of the preferred solution, people are increasingly jumping onboard with the idea that technology may have serious long-term effects for the value of, and demand for, human labor. It turns out John Connor was right; the robots are coming for us. Just not in the way we expected.